One of the most pressing planning problems throughout the country is commercial strip development. Strip development is contrary to the basic elements of good planning: it consumes open space and depletes natural resources, impedes pedestrian and non-motorized traffic, grows outward from the limits of existing development, and ruins any sense of place. Yet more strips are created every year and many communities seem to have no idea how to stop or control them. ... What specific steps can be taken to control or ameliorate this type of strip development? In the following pages, you’ll find an overview of some approaches to consider – along with photos of some good and bad examples of commercial corridors. 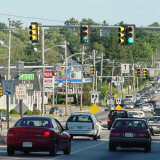 Many communities, in their comprehensive plans, include goals related to concentrating development in nodes or clusters and reducing the amount of auto usage. 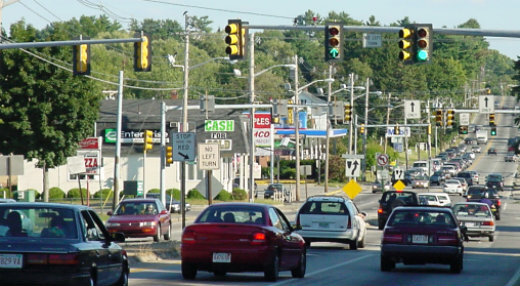 Yet local zoning regulations still usually allow for retail development to be strung out in a linear pattern (often miles long) along major road corridors – a pattern at odds with plan goals. Zoning is perhaps the single most important tool communities use to shape the pattern of development. Zoning can either facilitate commercial strips or prevent them from happening (or expanding). An alternative to a strip pattern, which still meets the demand for retail space, is to designate retail clusters or nodes around major intersections and limit retail uses on the rest of the corridor. These nodes can be planned to integrate other commercial, office, and even housing development, along with retail uses. Again, zoning can either enable or prevent this from happening. ... article continues with short sections on: architectural standards; the use of plantings; sign controls; and dealing with traffic congestion & pedestrian access.